Fintex Capital is delighted to announce that it has been recognised as Aggregator Of The Year at this year’s AltFi Awards. Fintex Capital was also named as a Most Innovative Product Of The Year, having delivered a cutting-edge product to the institutional investment community. 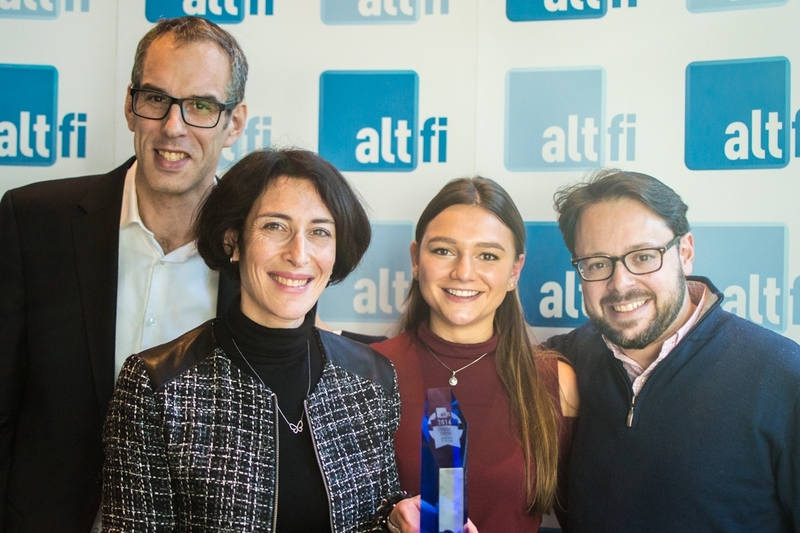 AltFi is Europe’s leading news service for the fast-growing alternative finance industry, which includes crowdfunding, P2P lending, marketplace lending as well as invoice financing. The AltFi Awards serve to acknowledge outstanding achievement within alternative finance. Fintex Capital was selected by an independent panel of industry experts. Robert Stafler, Fintex CEO, said: ‘We announced in October that our asset base is growing at a higher rate than we had previously anticipated. Having launched less than a year ago, we look back in the knowledge that Fintex Capital already reached EUR 50 million of investment assets in just 10 months. The awards we have received reinforce our view that Fintex Capital is a unique and innovative operator in alternative finance. I am delighted that our excellent team is being recognised for delivering a high-quality institutional solution with a creative approach and a can-do attitude. Fintex Capital’s mission is to transform the way institutional investors access p2p platforms. Fintex Capital purchases sizeable portfolios of loans originated on leading marketplaces as principal. To finance these portfolios, our customers – typically large asset managers, banks, insurance companies, pension funds or family offices – purchase bonds issued by Fintex linked to discrete loan portfolios. Our Bonds are capital markets-friendly instuments; they carry an ISIN and are settled through Euroclear and Clearstream thereby eliminating time-consuming processes. In doing so, Fintex enables meaningful capital to be deployed on marketplaces in a well-managed and hassle-free manner, with professional risk management processes in place. To manage its investments, Fintex employs a high-quality team and proprietary risk management tools, developed in-house. These tools perform thorough cohort and vintage analysis, enabling our team to closely track the performance of each loan while providing sophisticated monitoring, reporting, valuations and projections to a top-class standard. Fintex is highly selective of the marketplaces it invests on. Our team works closely with our partner platforms. As such, our customers benefit from direct and privileged access to market-leading lending platforms. Fintex was founded by Robert Stafler and Jérôme Anglade, two veterans in the marketplace lending arena. The wider Fintex team has many years of experience in P2P lending as well as an in-depth understanding of structured credit, securitisation markets, real estate, consumer and SME finance. It was created to originate, structure and manage bespoke lending platform investments for professional investors with an institutional mindset. Its aim is to deliver capital preservation, consistent income and superior risk-adjusted returns. The Fintex offering is aimed at investors who prefer bespoke and transparent investments over traditional investment funds. Fintex was specifically designed as an issuer of bonds, a format participants in global capital markets are intimately familiar with. In doing so, Fintex Capital provides a missing link between Europe’s leading lending platforms and global capital markets.